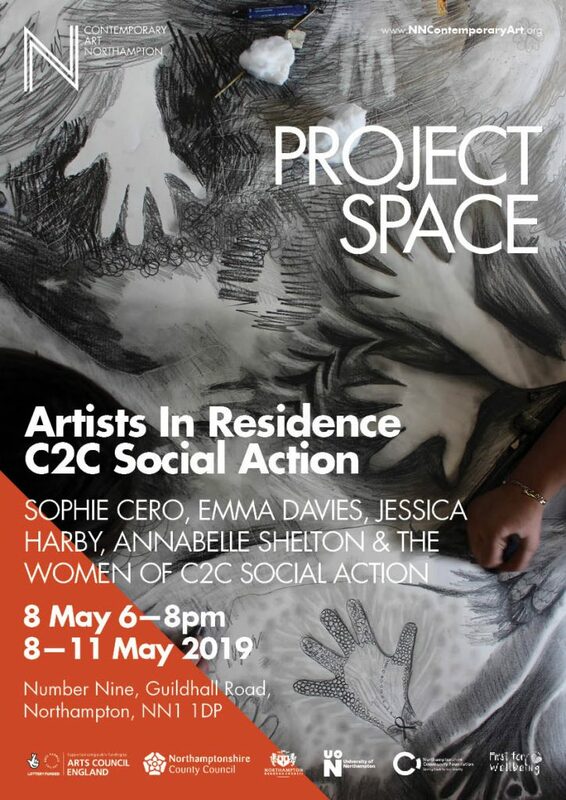 From 8th May until the 11th May, I will be showing new work that has been directly inspired by this residency, alongside work by fellow artists, Sophie Cero, Jessica Harby and Annabelle Shelton and by the women from C2C Social Action, who we have been working with over the last 3 months. The exhibition is at the Project Space at NN Contemporary Art and is open from 11am – 6pm Weds – Friday and 11am – 4pm Saturday 11th. The Private View is on Wednesday 8th from 4pm – 6pm. 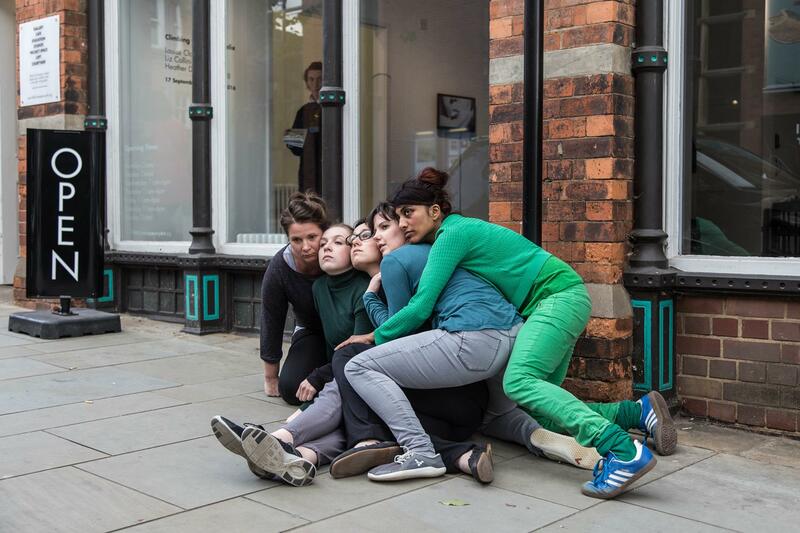 This month sees the start of a brand new project, funded by The Arts Council, lasting three months and with three other artists Sophie Cullinan, Jessica Harby and Annabelle Shelton. The project is called Artists in Residence at C2C Social Action and was set up by Sally Sheinman. We’ll be working and collaborating with a group of vulnerable women to experiment with materials and ideas. As we support the women in creating exciting works of contemporary art, as artists, we too will create new work inspired by the project. To celebrate the end of thee project, as a whole group, we’ll show a selection of the work produced in two exhibitions; dates and venues tbc. I am delighted to announce that I was nominated for and have been accepted as a Fellow of the Royal Society of the Arts (Royal Society for the encouragement of Arts, Manufactures and Commerce) The RSA’s mission is to enrich society through ideas and action. With a global network of 29,000 fellows, I look forward to developing links, learn from specialists with interests ranging from the Circular Economy to Youth Engagement and setting up projects and helping with research. I was nominated due to my work as the Education Curator for Fermynwoods Contemporary Art. As young people grow up in an increasingly destabilising world, I am passionate about inspiring them through creativity to have self belief, find their own voice and to gain the confidence to engage with society and fight for a healthier and happier world. 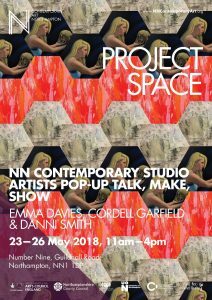 On 23rd and 26th May I will be holding an Open Studio Event along with fellow studio holders at NN Contemporary Art. I will be showing work produced (and still in progress) from my residency on the AA2A scheme at De Montfort University. On 19th April at CVAN EM’s annual event, this year titled ‘Another World is Possible’, I was invited to contribute towards the event with something that explored the theme of risk taking. Unable to attend in person, I devised a worksheet for artists called ‘Risk Assessment’. ‘Risk Assessment’ asks artists to plot both their personal lives and art career/ professions onto a diagram that helps to ascertain how risky or safe their approach is in these areas. It seeks to ask questions of the individual about risk taking; for example does safety in ones personal life provide a firm grounding that enables experimentation in art practice and direction? Or is an individuals career ‘stuck’ and are a few risky moves needed to invigorate it? Copies of Risk Assessment are available as a PDF below or can be posted for a small charge. I’m excited to announce that I have been selected to take part in this years AA2A scheme at De Montfort University. This is an artist in residence scheme for practicing artists. I graduated from De Montfort in 1993 and it is brilliant to be back. For the residency, I will be working on ‘You Can’t Shake Hands with a Clenched Fist’ and will be developing a series of screen print protest posters; a set of letter stamps to enable the process of participatory printmaking; placards and possibly – installation furniture and a soundscape. Ambitions are high, but am prepared for time to limit the wish list. You can read a blog about my experiences and development of work here. I am delighted to announce that I have received Arts Council England Lottery Funding to deliver ‘Living Lines’: an all day Big Draw Event, in Geddington, Northamptonshire. 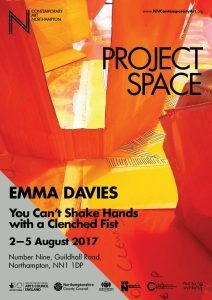 From 2nd to 5th August, 11am – 6pm, I will be back in the Project Space at NN Contemporary Art with my new project ‘You Can’t Shake Hands With A Clenched Fist’. This is a public participation project, so help is needed to make this happen. ‘You Can’t Shake Hands with a Clenched Fist’ was a statement made by Prime Minister Indira Gandhi when discussing the wish to avoid war ‘at all costs’. She saw the importance of discussion over and above fighting to settle differences. We live in an unsettling age, balancing on a precipice. In England, the Education system is undergoing yet more changes, and fast becoming a learning environment unsuitable for many, with the arts being sidelined and pushed out of the curriculum. Academia versus creativity. Scheduling and exams versus independent thought and exploration. Globally, capitalism is under serious question as the divide between rich and poor continues to escalate, yet a universal financial overhaul seems like a utopian dream. The whole world is under threat of climate change, that, I believe, has been caused by industrialisation and western extravagance, but there are many, scientists included, who think that Climate Change is a non issue. We have come a long way in accepting each others differences such as race, religion, gender, sexuality and neuro-diversity, but we are not there yet – not by a long shot. Opposing voices shout at and over each other, each convinced of their own truth. Amongst our peers we struggle to find the courage to voice an alternative opinion for fear of being questioned, doubted or ostracised. But if we listened and refused to be blind-sighted by our own ego’s, then we may just be able to reach some common ground and learn from each other. 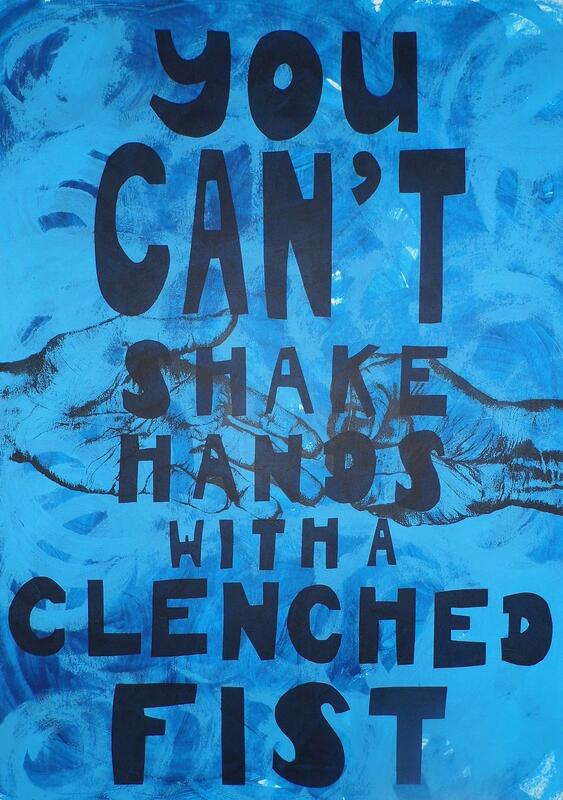 ‘You Can’t Shake Hands With A Clenched Fist’ will be a safe place to tell me what you think. I will listen – as we don’t do enough of that these days. Then, these conversations, ideas, thoughts and feelings, I’ll transcribe through live writing onto wallpaper and participants are welcome to convert into posters, make into colourful symbols and shapes, helping to create an immersive installation that captures a diversity of opinion. However, it won’t be a case of ‘anything goes’. Anything that incites or is disrespectful will not be included. Nina Simone said that it is ‘an artist’s duty to reflect the times’. These words are beginning to resonate: more often, I should use my platform as an artist to engage, communicate with and even challenge the public. This month I am very proud to be the East Midlands Contemporary Art Network’s ‘Meet the Artist’. Elizabeth Hawley, the co-ordinator of CVAN EM, interviewed me at the beginning of this month. In the interview, I discuss ‘The Lost Years’, what has made me who I am and the type of artist I am today, artists as polymaths, inspirations and the development of my work. For one week only (Mon 27th March to Sun 2nd April), I am also taking over their Instagram account, in which you can track my day to day movements and activities. I was so chuffed to have been shortlisted for the Creative Climate Change Leadership Course, held in Wales, co facilitated by Julie’s Bicycle (UK) and Pina (Slovenia). I didn’t get selected in the end, but my engagement in the process has established fantastic new contacts and kick started my passion and commitment in adopting a focused environmental strategy within my practice and work with organisations. Over the coming months I will be developing an Environmental Policy, which will be available on this website. Among the shortlisted applicants, I was in great company. In total, one hundred and eight applications were sent in, so to be shortlisted was a great honour, especially as applicants were from all around the world and included fashion houses and theatres. The map of applications can be seen here. On Saturday 22nd October I took part in Swarm Sculptures at NN Contemporary Art. 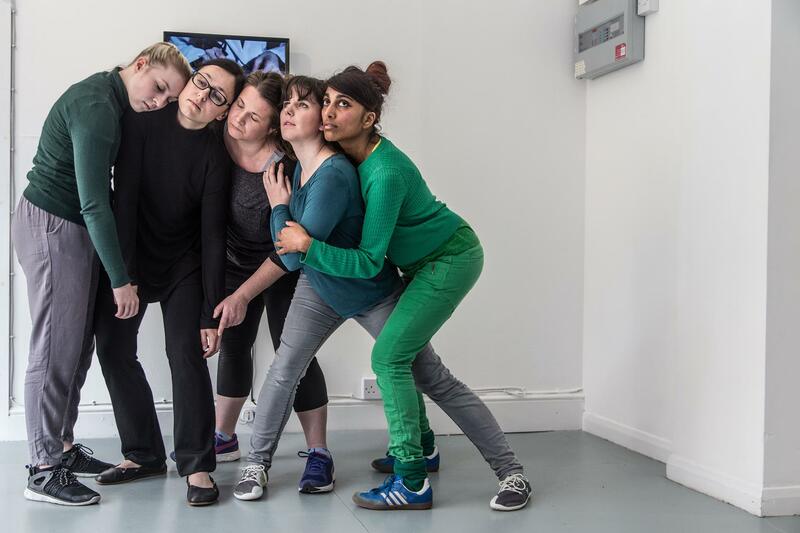 This was a durational movement installation devised and choreographed by Lucy Suggate and supported by Dance 4. The piece has been on tour to places including Bonn, Paris, Nottingham and Leicester. 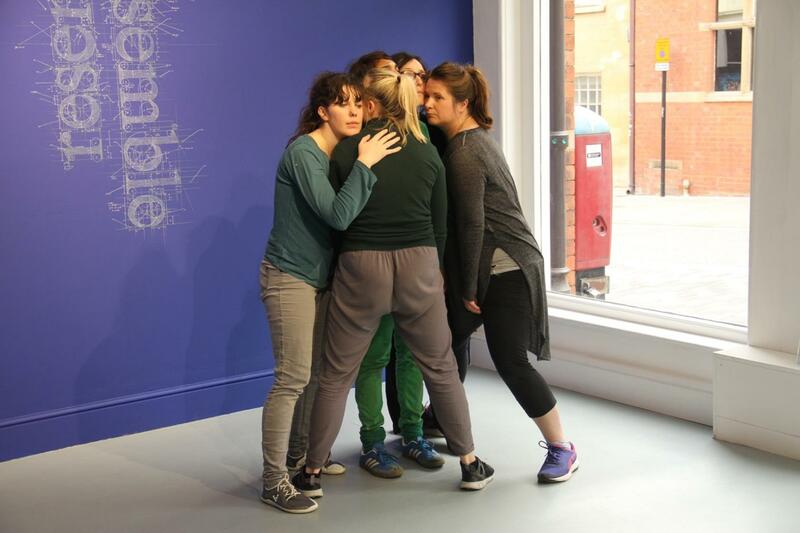 Here are some images from the performance and you can view lots more on NN Contemporary Art’s Flickr site. On Saturday August 20th I will be having a House [Sale] at NN Contemporary Art Guildhall Road, Northampton from 2- 6pm, in the Courtyard, part of their Table Top Sale. I am delighted to say that in March I was awarded an A-N Professional Development Bursary. I will be using this award to go on a veritable smorgsboard of adventures and I will document these via a blog on A-N.
April 2nd and 3rd – Weekender at Arts Admin, Toynbee Studios, London. 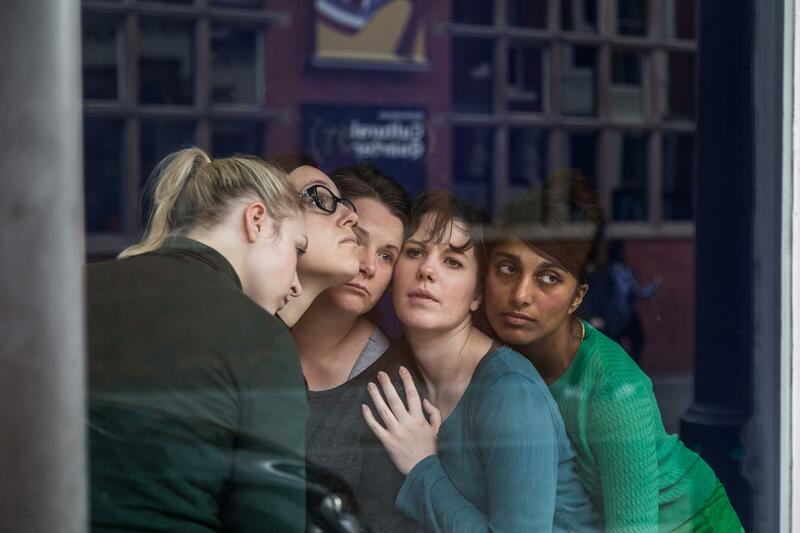 Two day workshop led by the wonderful Vlatka Horzat, entitled Unstable Spaces. Web, Film and Sound Editing Training with James Steventon. June – Attendance at Events for the London Arts, Health and Wellbeing Week.